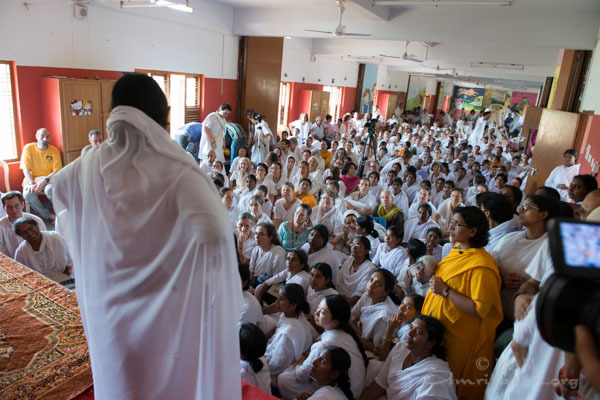 After a 20 hour bus ride from Amritapuri, Amma and the tour group arrived at MAM Mangalore in the early morning hours of February 14th. 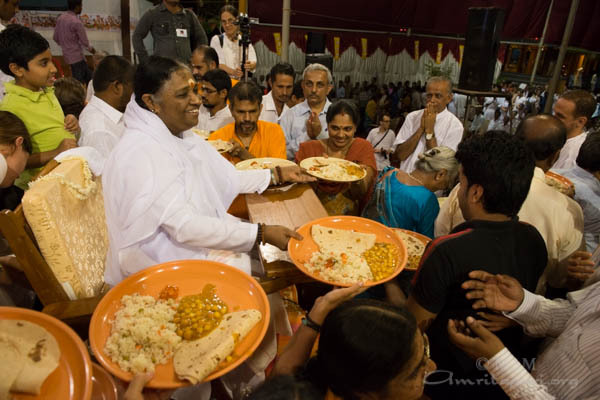 The same evening Amma called all local devotees and tour staff to receive her prasad dinner and join in what turned out to be a grand celebration to start this year’s Bharat Yatra. 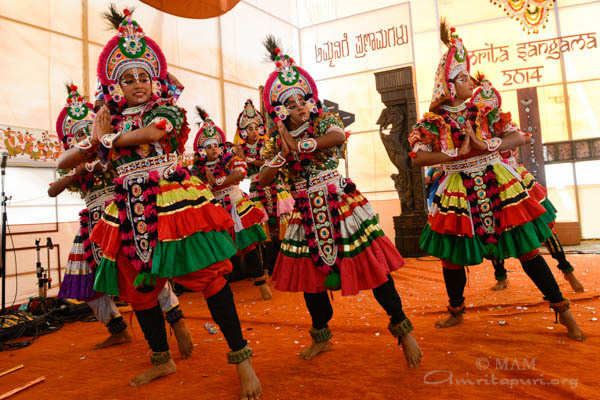 As Amma sang two new folk songs the programme venue turned into a festival ground where young and old, Western and Indian children alike danced and cheered. The itinerary of the first part of the 2014 Bharata Yatra is somewhat unusual as compared to previous years. The tour started in the state of Karnataka north of Kerala and will then continue south back to Kerala. 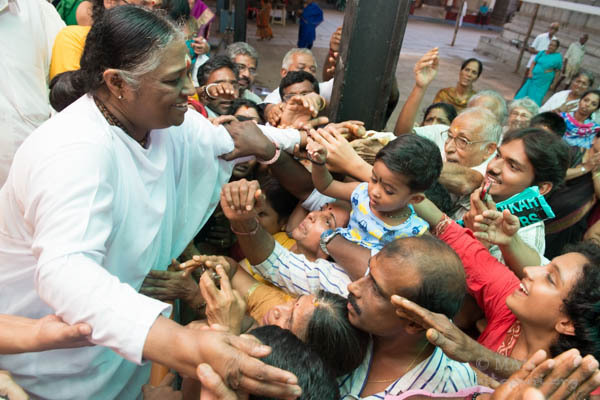 Since only one city in Karnataka is included, devotees from all parts of the state traveled to Mangalore so they would not miss the rare blessing of Amma’s presence in the state. 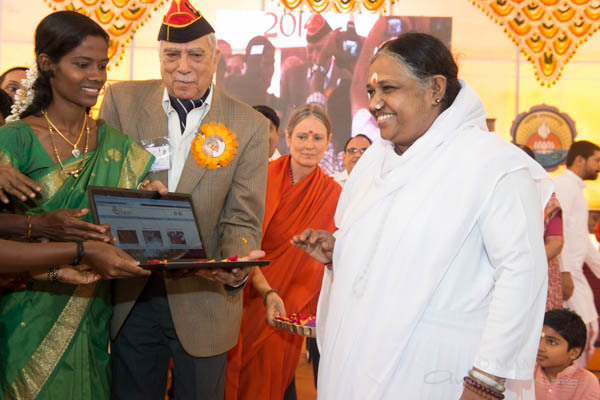 Former Deputy Chief of the Army, Lieutenant Gen (Retd) Dr. NS Mallik, and play back singer Ravi Kiran took part in the public function on February 16th, during which Amma handed over scholarships to 75 students. MAM also announced a large new charitable venture, the adoption of Karnad village (near Mulky) under the ‘Amrita Self-reliant Villages’ programme. One part of the project will include free computer-supported vocational training for local women. To launch this aspect of the programme, Dr NS Mallik distributed free laptops with the vocational training software to the village women. MAM pledged to provide all the basic facilities, including education, to the villagers. For the past few months AYUDH volunteers have already been visiting the village to do seva and conduct spiritual programmes. Karnad is one of 101 villages in India that has been selected by MAM to be turned into a self-reliant role model village for the country. It will receive all necessary support by MAM to establish the required infrastructure, training and healthcare to achieve this goal. 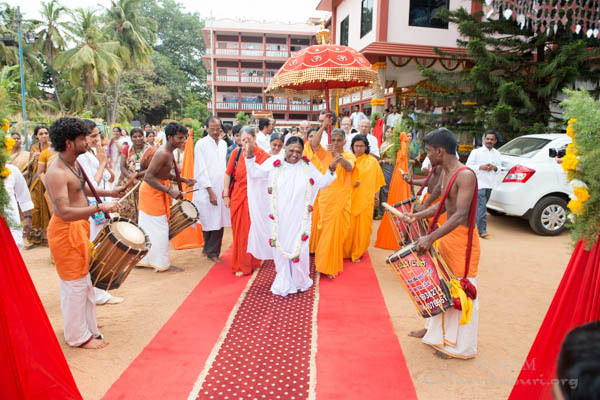 During both programme days, 15th and 16th of February, Amma sang many new songs in Kannada and also led the manasapuja in the local language. 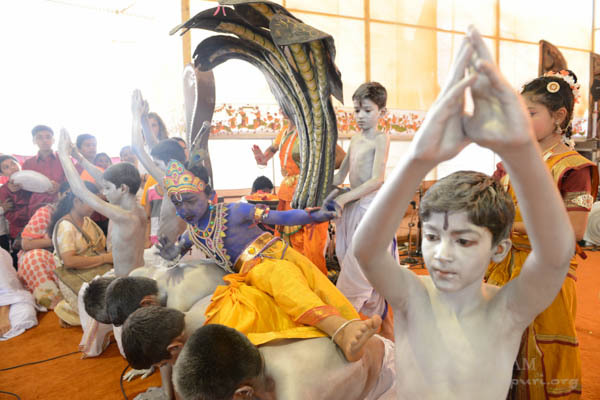 Children from several Amrita Vidyayalam schools presented a variety of cultural programmes. 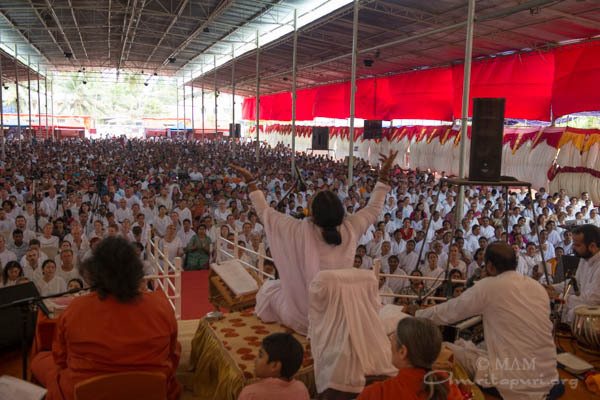 As one of there main seva on tour, many of the Ashram’s international volunteers participated in the ABC Campaign to keep the programme venue and surrounding places clean, recycle trash and educate people about public hygiene and health. On the way to Mangalore, Amma and the tour group stopped for lunch at Amrita Vidyalayam in Thrissur. 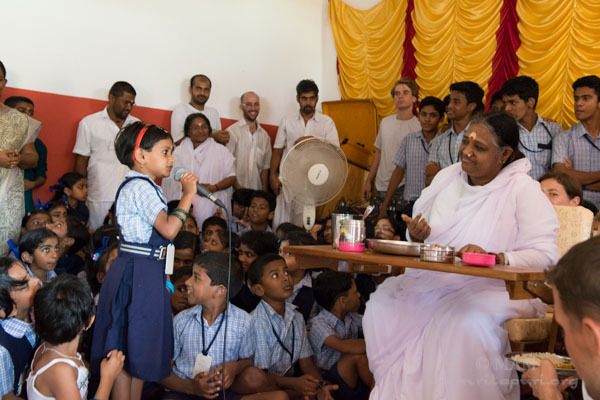 On top of the 600+ indian and international children on tour the students of ASHIS (the Amrita Speech and Hearing Improvement School) had the chance to spend two beautiful hours with Amma. ASHIS is one of the few schools in Kerala that scientifically teaches hearing-impaired children to speak. More than 120 students attend the school. The children have a 100 percent pass rate in the Secondary School Leaving Certificate Exam and do very well in obtaining employment. 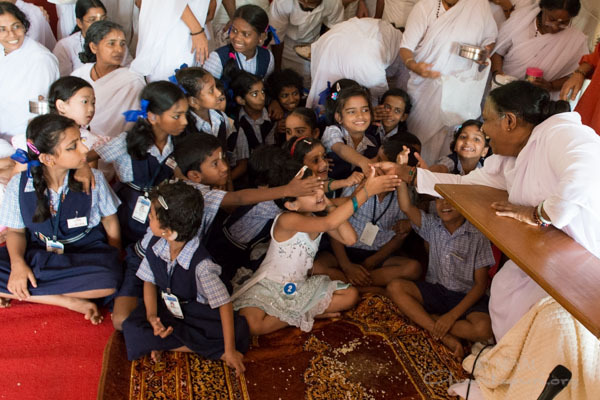 The faces of the children lit up as soon as they saw Amma and each one of them wanted to grab her hand. Amma called them to sit right next to her chair, so that she could interact with them closely. One by one Amma asked the children to recite the songs and verses they had learned, despite their hearing disability. Roaring applause followed each one of the short presentations, which the students gave full of confidence and a beaming smile on their faces. Amma taught them how to say “Om Namah Shivaya”. She slowly pronounced each word and made very clear facial expressions to help the children catch the sounds and repeat them correctly. 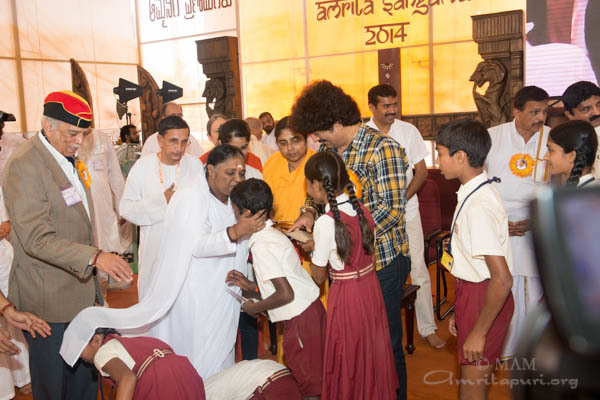 It was very touching to see these happy and well-educated children spend such precious moments with Amma, who had not only taken full care of their academic education, but also provided them with a loving spiritual environment in which they can flourish, build up their self-esteem and explore their potentials, regardless of their disability. Next Amma asked members of the tour group to tell stories with a spiritual meaning. 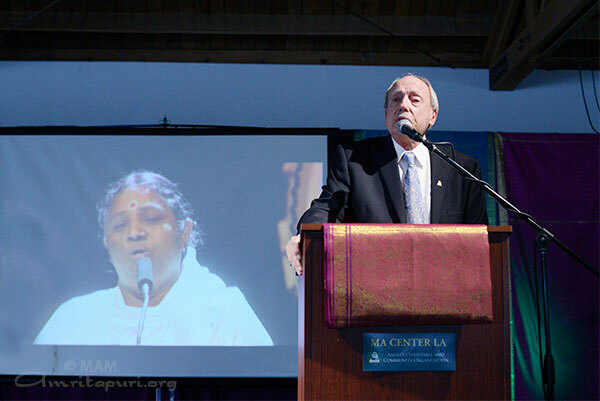 Gaurang, one of Amma’s North American devotees, told about the transformative power that Amma’s advice for the new year 2013 has had on him and his family. 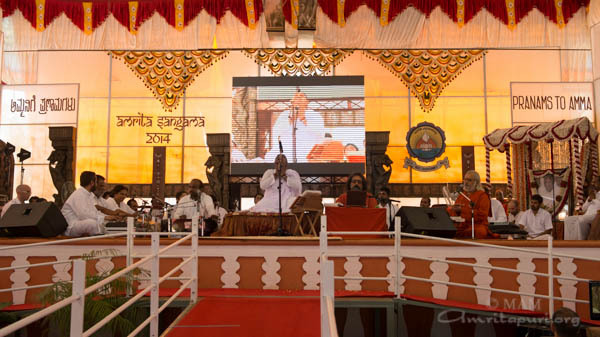 In her satsang Amma said that instead of making new-year resolutions, which we would break anyways, we should instead try to forgive and forget the mistakes of others. Taking Amma’s advice to heart, Gaurang wrote an email to his step-father, to whom he had not spoken to in years. In fact, during the past 20 years they were never able to establish a real loving relationship and instead ignored and avoided each other. However, now both of them felt that it was time to reconcile and planned to spend time together when Gaurang would return to Canada prior to the North American Tour 2013. Shortly afterwards his step-father was diagnosed with terminal lung cancer and the doctors gave him only a few more months to live. Gaurang was asked to return to Canada by his step-father to prepare him for his passing. 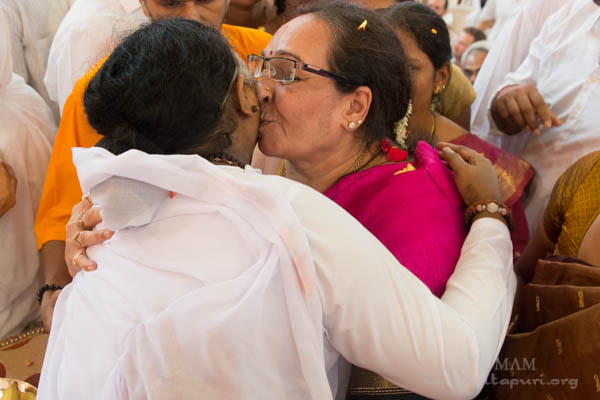 During that time their relationship deepened profoundly as Gaurang introduced his step-father to Amma’s teachings and guided him in various spiritual practices to help him cope with the challenging situation. As his physical strength diminished, Gaurang led his step-father in a breathing technique, which included the chanting of Om. It was while chanting this sacred syllable that his step-father looked over to him with wide eyes and slowly closed them, leaving his physical body filled with peace and grace. Gaurang expressed his gratitude to Amma for having given this simple, yet powerful advice for the New Year, which has resulted in reuniting his family and overcome the bitter memories of the past. 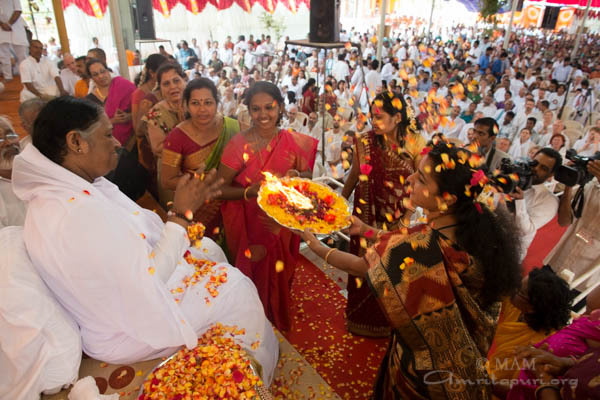 Amma concluded by commenting that we can only experience peace if we let go of our anger and resentment. We should not allow such negativities to rot in our minds, which would prevent us from opening up and experiencing true peace and contentment in the present moment. 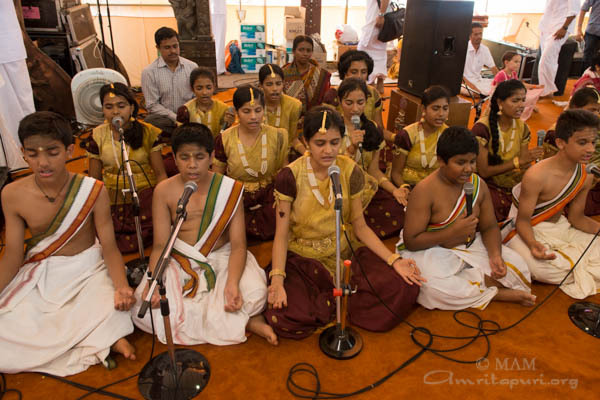 After one last loud and proud “Om Namah Shivaya” by the students of ASHIS, Amma and the tour group continued their journey to Mangalore, the first stop on the 2014 Bharata Yatra. 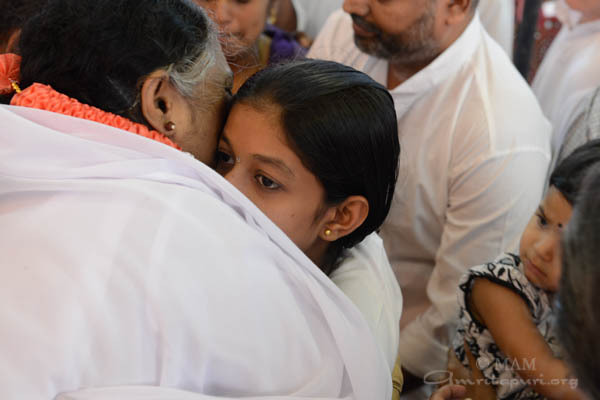 Everyone felt not only nourished by Amma’s prasad, but also tremendously inspired by Amma’s words and deeds – the seeds of transformation that Amma spreads wherever she goes. 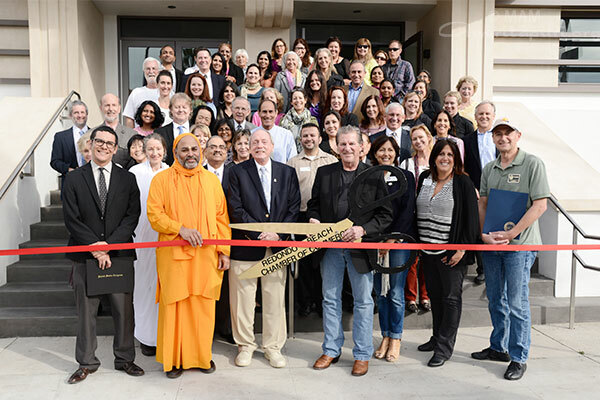 Two hundred honored guests, including state and local officials gathered on January 21st for the official ribbon cutting ceremony to inaugurate the MA Center LA, located at 128 South Catalina Avenue. 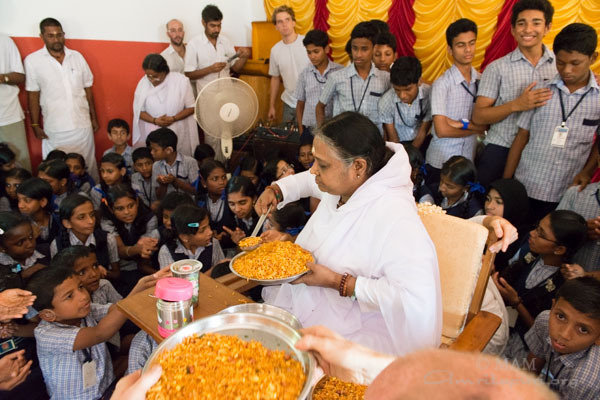 The new community center is part of the United Nations affiliated NGO, Embracing the World (ETW), a charitable outreach organization founded by Mata Amritanandamayi Devi, the celebrated spiritual leader and humanitarian. Other fifteen commendations were presented to the MA Center community by the officials of the city and around. A newly refurbished art deco landmark, the MA Center LA (128 S. Catalina Avenue) is one of the oldest buildings in Redondo Beach. MA Center LA aims to become a vibrant hub for advancing humanitarian activities and community service throughout Southern California. 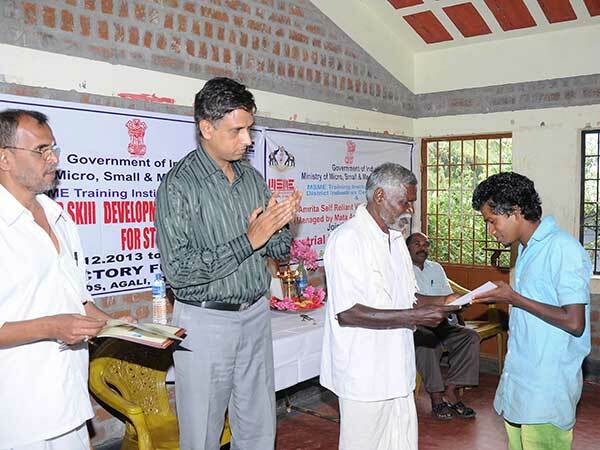 In Attappady, an electrician course was conducted at Kottatara Karandara Community Hall for Adivasi youth. The 45 day long course was organized under the auspices of the Amrita Self-Reliant Villages program (Amrita SeRVe) in association with the Ministry of Micro, Small & Medium Enterprises (MSME), Government of India. Amrita SeRVe is a program initiated with the goal of helping 101 villages throughout India establish their required infrastructure to become self-reliant role-model villages. The course was organized on the basis of requests received from the chiefs of the tribal hamlets, known locally as Mooppan. The trained electricians performed the wiring of two homes and finished incomplete electrical works in other homes using the electrical supplies provided to them during the course and decided to perform repairs for free for all people in the hamlets.